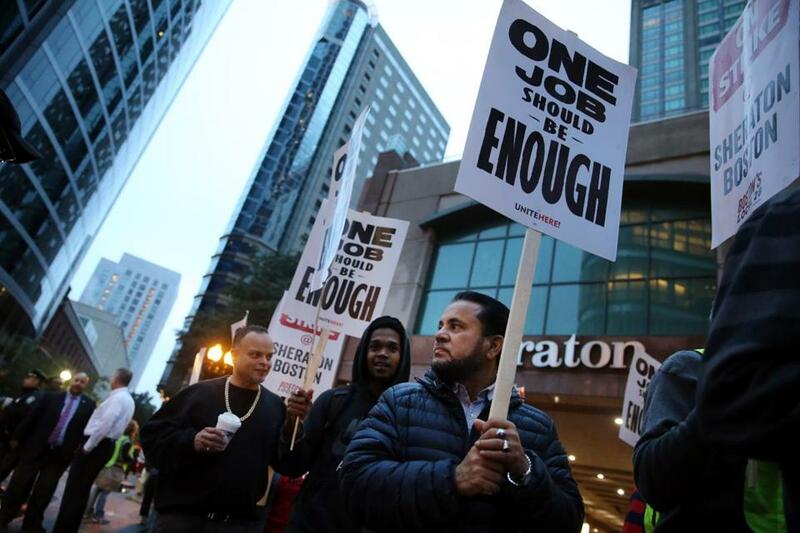 Workers and supporters picketed outside the Sheraton Boston by Marriott on Wednesday. 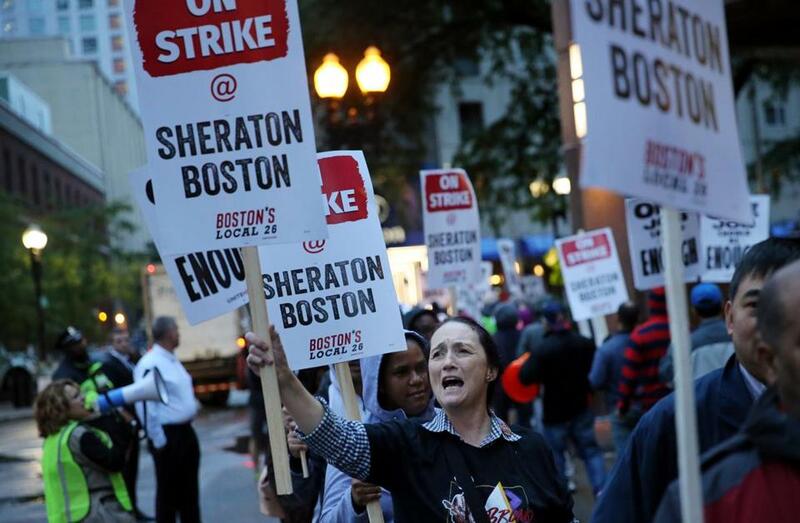 The work stoppage involves more than 1,500 Marriott International employees, from housekeepers to bartenders to doormen, at some of the city’s most prominent hotels, including the Ritz-Carlton Boston, Sheraton Boston, and Westin Copley Place. Heading into the holiday weekend, some guests were informed that they would not receive room service or house cleaning. Restaurants closed. Further disruption was possible as the union representing UPS workers said they would not cross picket lines to deliver food or other provisions. The hospitality workers union, Unite Here 26, is pushing for more protections for workers as the industry undergoes major changes, mainly driven by technology, and is calling on companies to protect worker hours, provide more secure schedules, and improve sexual harassment protections. The union represents employees at more than 30 hotels in the Boston area but is focusing on Marriott — the largest hotel company in the city and the world. Thousands of Unite Here members have authorized strikes at Marriott-owned hotels across the country, in San Francisco, Detroit, Seattle, San Jose, San Diego, Oakland, and Honolulu, but Boston workers were the first to walk off the job. An ongoing hotel strike in Chicago is not part of the Marriott campaign. Marriott said its hotels will remain open but did not say if it would bring in replacement workers. Marriott did not say whether guests were canceling reservations because of the strike. At least one visitor coming for Patriots and Red Sox games said he considered finding a different chain until the hotel assured him everything was fine. The Marriott action marks the first time Unite Here has targeted a national hotel chain in this way, said Brian Lang, president of Local 26. Between 2013 and 2017, Marriott International’s net income more than doubled, to $1.37 billion, and has continued to climb in 2018, according to company data. “We think that they have a particular responsibility as such to set a standard that really recognizes the work of the employees who create the value that allows them to make the kind of profit that they have,” Lang said. Diane Bastos picketed outside the Sheraton Boston by Marriott, where she worked as an attendant in Boston. Marriott said in a statement that it was “disappointed” Unite Here had called a strike and noted that its wage increase proposal matched what was in the last contract, “which included the largest increases in the parties’ bargaining history.” The company said it did not propose changes to health, welfare, or retirement benefits. Of the 18 Marriott properties in Boston, eight are unionized. One of them, the Renaissance Boston Waterfront, agreed after the strike authorization vote to accept whatever contract the union hammers out with other hotels, according to Local 26, thus avoiding a strike there. Several major Marriott-flagged properties, including those on Long Wharf and in Copley Place, are not union hotels. At the Sheraton Boston, workers kicked off their picket line at 5 a.m. Wednesday, a few days before the long holiday weekend, chanting and hoisting signs in the damp, chilly air. Jissely Paulino, 27, has worked as a housekeeper at the Sheraton for five years, making $21.45 an hour, with a pension and generous health insurance — at least when business is good — with no copays or deductibles. But in the winter when the hotel isn’t full, she works less, collecting unemployment to get by. If she doesn’t work enough hours, her health insurance is cut, too. Marriott’s Green Choice program, which offers guests incentives to skip housekeeping, also cuts into her hours. Like other Marriott housekeepers, Paulino sleeps with her phone under her pillow in case the hotel calls with an extra shift. Paulino and her husband, a maintenance worker, live with their four children in a subsidized apartment, and Paulino works a second job delivering pizza to make ends meet. In all, she works as many as 70 hours a week. “Life in Boston is so expensive,” she said. Not far from the picket line, three women attending conferences at the Sheraton smoked cigarettes and sipped coffee in the early-morning darkness. The women weren’t staying long and were unconcerned about the lack of service, but they wondered about the $500-a-night room rate while workers had to take second jobs to stay afloat. Similar to airlines, hotel chains such as Marriott that have merged or acquired other brands are using their consolidated power to reduce labor costs, said Randy Albelda, an economics professor at the University of Massachusetts Boston. And unions, in turn, are going after these industry giants. “There’s a long history of unions following the lead of capital in terms of how to organize and how to fight back,” she said. Local 26 has held several one-day hotel walkoffs in Boston, and a few work stoppages took place in the early 1900s, but this is the first full-fledged strike since labor laws were enacted in the 1930s. The union’s last strike was in the fall of 2016, when dining hall workers at Harvard University walked off the job for 22 days. 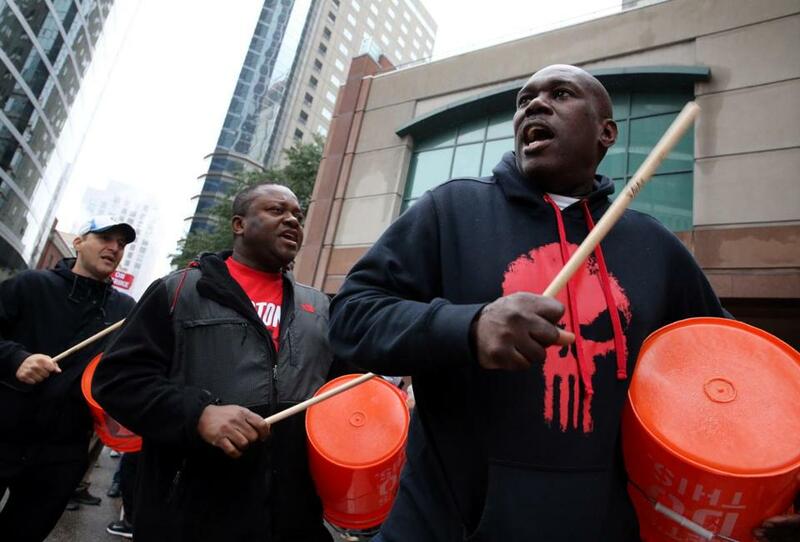 At the W Boston in the Theater District, the protest ramped up at 7 a.m., when police allowed workers to use bullhorns and beat on buckets with drumsticks. Juan Eusebio, a doorman at the W for eight years who makes $10 an hour plus tips, said his income has gone down 40 percent over the past three years as gratuities have plummeted. No one carries cash anymore, he said, and no one needs him to call a cab because they can summon an Uber or Lyft on their phones. Eusebio, who has a 6-year-old son and a bachelor’s degree in hospitality management, has moved from Allston to Quincy to Jamaica Plain to Chelsea, chasing affordable rents, and he still barely gets by.